Myra Janco Daniels doesn't reveal her age but a little simple math offers no reason to dispute her claim of being "probably the oldest CEO in America." The 1948 Indiana State Teachers College graduate was among the first women to excel in the male-dominated advertising world. Still active in her second career in the arts, Daniels is chairman, president and chief executive officer of the Philharmonic Center for the Arts in Naples, Fla.
Daniels' first business venture came before grade school but it was Indiana State and Terre Haute that helped launch her on the road to lifelong success, she said during a campus visit last week. She chose to attend what is now Indiana State University over the University of Chicago and Northwestern University after college President Ralph Tirey met her at the bus station when she came to visit campus and took her to lunch. Tirey noted her success as a high school debater and suggested she'd be a good fit for the college debate team. Daniels' tales of determination are many. Delivering the keynote address Saturday to a regional meeting of the Music and Entertainment Industry Student Association, she told of at age 4 starting her own business making party favors at her grandmother's home in Gary. It wasn't until her father pointed out that merely making a product wasn't enough that she recruited someone to handle marketing - a boy who happened to walk past the family's home every afternoon. Janco Party Favors turned a profit of several hundred dollars - and it was run by youngsters in a steel town in the midst of the Great Depression. While attending Indiana State, she stayed in the Victorian home of Goldie Hiatt, a local teacher who lived near campus, in exchange for housework and typing. Having never washed laundry while growing up, Daniels promptly got her hands caught in a wringer washer and took her landlady's clothes to a Chinese laundry. She tearfully confessed only after Hiatt marveled for weeks about how neatly the laundry was folded. She was surprised and relieved when the older woman laughed and said, "Why didn't I think of that idea before?" Daniels' advertising career began after longtime Terre Haute Star editor Marsee Cox refused to hire her. The Indiana Statesman had won several awards under Daniels' leadership as student editor - as a freshman. But Cox was unimpressed, saying "We're not hiring paper dolls." The brash teen-ager walked two blocks to the Meis department store. Advertising manager Sol Korshak hired Daniels on the spot after she quickly typed up some ad copy. She would go on to design an ad that resulted in 700 dresses practically flying off the racks of one of Terre Haute's most prestigious department stores. She eventually launched her own agency, Wabash Advertising, and built it into a $1 million per year business in its first year. It was her time at Indiana State and in Terre Haute that taught Daniels the importance of making connections, she said. "If you don't try, you don't know whether it will ever fly," she told future music and entertainment industry leaders meeting at Indiana State. Daniels completed a master's degree in 1958 and taught business marketing classes at both Indiana State and Indiana universities. 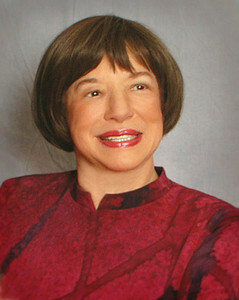 She is a Distinguished Alumna of ISU and holds an honorary doctorate from her alma mater. At 38, Daniels became executive vice president of Roche, Rickerd, Henri, Hurst in Chicago, an agency formed by the merger of two firms. She was the first woman to hold that position for either company, the first woman to head a national advertising agency and the youngest woman to win the National Advertising Federation's "Advertising Woman of the Year" award. In her book "Rutbuster," Daniels tells of another milestone, her business relationship and marriage to Draper Daniels, the adman known for creating the image of the "Marlboro Man' and the inspiration for the character of Don Draper on the popular AMC television show "Mad Men" about a 1950s ad agency. Draper came to Myra's agency in Chicago with the intention of buying the business. Their meeting dragged on into the night. He told her he wanted to buy the business, that he wanted her to stay with the company - and that he wanted to marry her. Already engaged to someone else, she asked her original fiancé to postpone their wedding and told Draper she had no plans to get married without at least a year of courtship. But it took only six weeks for Draper to persuade Myra to say "I do." Their marriage lasted from 1967 until his death from cancer in 1983. It was after Draper's death that Myra launched the Naples Philharmonic Center for the Arts. "I had to get busy," she said. She told students how getting the center off the ground was challenging even in a city that is home to many wealthy retirees. Daniels responded to a threatening caller, who objected to "outsiders" being brought in to the quiet south Florida community, by talking to him about how the arts could enhance the community. Once the center was open, the caller and his wife started attending ballets and other performances and contributed $200,000 toward the facility's expansion. The center is still profitable at a time when many venues around the country are struggling, Daniels said. "That's what can happen when you are persistent and you treat ignorance with kindness," she told students. "Not only do you get money to support your cause but as soon as you can you start giving money because by giving you get more." Acknowledging potential challenges to her claim of being the country's oldest CEO, Daniels said she is confident "there are very few people my age who work 14-hour days and have staffs of 465 people. The one thing that I believe the most is that everyone has an opportunity to change this wonderful world. The greatest charge I still get is being able to go home at night and know that I have accomplished something by helping someone." Daniels said her alma mater is doing the right thing by concentrating on experiential learning - a concept that has music business students setting up concerts and drafting real contracts. Chelsea Whittington, a senior music major from Brazil who has aspiration of becoming a symphony manager, found Daniel's message especially inspiring. "To hear about the Naples center's success at a time when things are not going well for these types of facilities in general is a great example for students. It was good to have her here," Whittington said. "If you have the right connections, money will always be available and anything is possible," said Cassandra Mielcarek, a junior from South Bend. But as Daniels' examples suggest, and as ISU students have learned in their classes and during other conference sessions, "you have to get out and make connections. You can't wait for people to come to you," Mielcarek said. 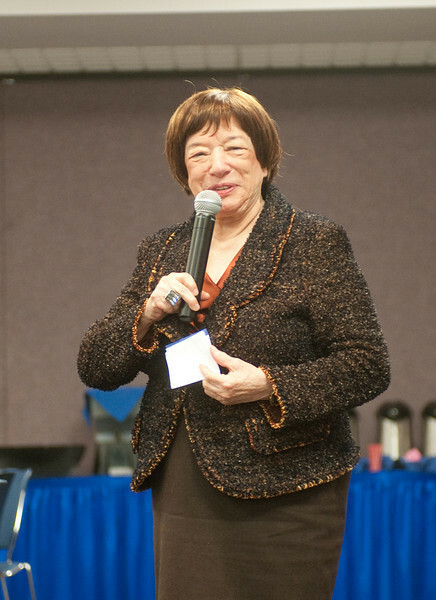 One of the first women to excel in the male-dominated advertising world, Myra Janco Daniels is still active in her second career as CEO of an arts center in Naples, Fla. Daniels was keynote speaker for a gathering of music students at ISU on Saturday.